Thinking around the drawings and the purpose they serve, which is invariably non commercial, and almost entirely installational and ephemeral, I am considering what role they play in the overall scheme of a performance. They are neither supporting imagery or studies derived from objects on display in the performance. Perhaps their function is much more mysterious and enigmatic? I am weary about trivialising their function or making a brief summary, but believe it is something akin to animating the objects and painting them into a metaphysical journey of transformation (through paint which is visceral and creates a tactile landscape of metamorphosis) and also about imbuing objects with tremendous significance and enhanced ‘reality’. 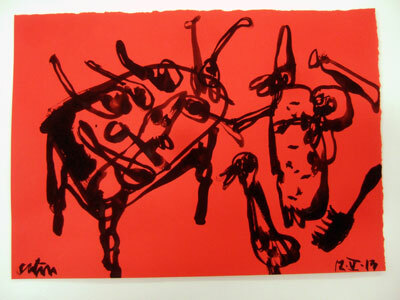 Strangely, the drawings are made with paint, seldom with crayons, during the performance. This reflects a visceral preoccupation with paint as matter. It guarantees a raw and atavistic image will be ‘born’ during the flow of the performance. The link with prehistoric cave art is very potent. I am thinking about George Bataille’s descriptions about Lascaux. 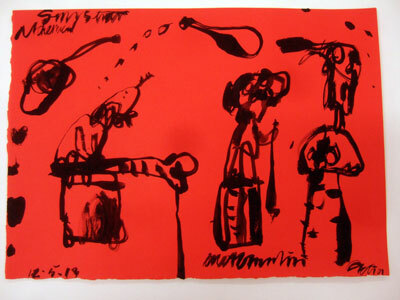 Outside of a performance the drawings function as souvenirs of memory. Psychic snapshots. Inventories of fragmented stories. Examinations of cyclical change. They are also another way of inhabiting the objects with creative imagination. Drawing is a kind of performance, a dance, an un-mouthed verse, a poem without words. There is an affinity with the art of children and those who have swallowed the primordial in creative gulps and given birth to an original utterance. I think of fragments when I draw. Fragments to me are like chunks of time distilled in the moment by the act of drawing which is tension and release. A good drawing is a vehicle for mini-catharsis. I am a collector of signs, symbols, insignia. People often ask me what my drawings are ‘about’ and I point them back into the unchronicled annals of prehistory, to the curious and sloping grid like formations in cave art, to the painted pebbles of Mas d’Azil, to spot paintings of the Aboriginal dreamtime, and the rock art petroglyphs of North America. Somewhere, amidst these signs my trajectory is unravelling itself like an umbilicus linking me to enticement. I have an obsession with stacking and objects piled up in impossibly toppling towers. I am ‘at home’ with the concept of the heap or the hillock of my own making. The more precarious and unstable the pile, the greater my thrill at being able to retrieve a much yearned for (seemingly lost) book. The prospect of an avalanche happening on a daily basis is an imminent possibility for me. I have to work carefully and stealthily around this chaos to avoid inertia and giving up my soul to the new fangled goggled screen. One invariably accumulates merely in order to lose everything again. This seems to be the basis of much of human experience and endurance in life. Much of the suffering in this life is related to accumulation and loss. Its the same in a drawing. You win some, but lose many.